The Wooden Spoke is an enterprise by “Big Mike” and Theresa Gray residing in a trailer on FM2978, sitting between The Woodlands and FM 2920. While his address shows as Magnolia, some people call this “new Magnolia” as it is miles from original downtown Magnolia and well, uhm, some folks try and distance themselves from the old Magnolia. Not that there is anything wrong with Magnolia, but the expansion of newer construction closer to the high end city of the Woodlands houses a bit younger crowd than the old school slower paced lifestyle of Magnolia proper. The Wooden Spoke sports a bit better of an environment than some trailers, with a couple of wooden tables underneath a solid roof which keeps the sun out of the way. They are adding on a second small building which will provide additional seating. On my first visit I met the proprietor, big Mike. Mike was very friendly and we chatted for a moment at the window when I placed our order for the reasonably priced standard two meat plate. He handed me a sample of the brisket with plenty of bark and it was very good. Right off the bat I tasted some sweetness in the rub as well as in the meat. Mike said he used Pecan wood, and agreed to a point on the sweetness in the rub. In BBQ cook off competitions your food is tasted with as many as 50-100 others, so the chefs tend to try for a different stand out taste. This usually ends up in more complex rubs and spices. My preferences still run to plain kosher salt and fresh pepper based rubs, but I did like the flavor on the brisket. 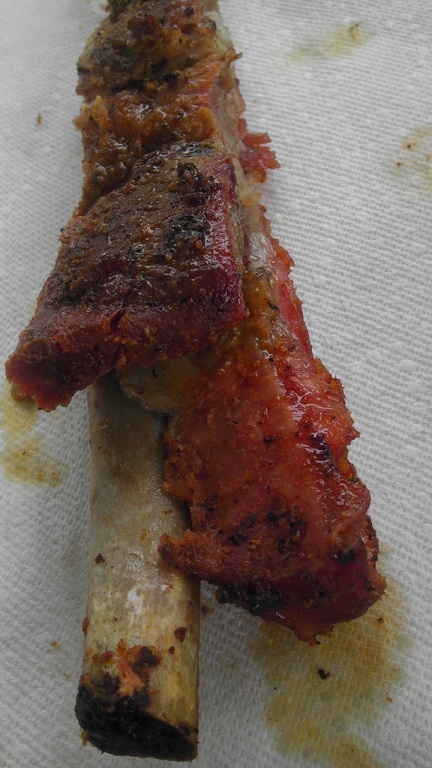 He also gave us a sample rib and the rub was even more prominent on the rib. I think it works better on the ribs. The sample rib was cooked spot-on, and was very tender and resisted just enough as the meat was lightly pulled away from the bone. The brisket served with our plate was good, and had a hint of sweet flavor from the pecan wood like the same. It wasn’t as good as that sample though – and the fat was less than fully rendered. The sausage had that slight gamey flavor that comes from pork and Mike also confirmed that it was a mix as well. It was good, but I normally prefer all beef. The rare exception is when I’ve had BBQ at multiple locations in a row such as my last visit to Austin, where I enjoyed the pork based sausage at Opie’s. The sausage here is also not house made; it is commercially bought. Mike also gave us a sample of his pulled pork, a dish that has been growing in popularity in Texas after being a wallflower for many years. Personally I like to stick with beef as my first choice, and the vinegary sauce that the pork was marinated in was not my style – but the meat was very tender and I think it would be work well in a sandwich, with the sauce soaked into the bun. It’s worth a try if you are looking for pulled pork in the area. The potato salad and beans here supported the rest of the meal as usual, but didn’t stand out above and beyond. We were unable to try any of the other side options on this first trip that look to be a specialty and we were also unable to try the “Big Mike” sandwich that looks to be interesting. Franklin offers the Tipsy Texan and a number of other joints have their own special sandwich but since I’m trying to compare the base meats I pass by these on my first visit. The Wooden Spoke is only a couple of miles from our house, and we will definitely be back to try again. It is genuine smoked meat and the best BBQ for miles around. I stopped by the Wooden Spoke to grab a bite for lunch and opted for the Big Mike sandwich. This is a monster with a pound and a half of meat; brisket, sausage, and pork loin. Sauerkraut and a special sauce round out the fillings and its surrounded on either side by a store bought bun. It was a lot of meat for the money, and I liked the sauerkraut mixed in with the meats and sauce. Sauerkraut is a pretty polarizing topping though so some may want to skip it. There were two large hunks of pork loin and they were moist but as mentioned before I am not a huge pork fan. On our third trip here we chose brisket, sausage, and a chopped beef sandwich for Wyatt. The brisket this time was a bit undercooked; while the bark was good the interior could have been left on a bit longer. The sausage was fine but unremarkable. Wyatt’s chopped beef was really good. I don’t think I have had one in several months since I started the blog but this was one of the better ones. Mike came over and talked with us again and handed us a huge baked potato with chopped beef. The person in front of us asked to exclude the sour cream after they were already making the potato so it was going to be tossed otherwise. The potatoes here are a good deal, really reasonable and it was loaded with brisket and cheese. We also sampled the banana pudding. I have seen the option at a number of joints but had been passing them over, especially when I had multiple stops lined up in a day. The banana pudding here was delicious, and the cool pudding wrapped up the meal nicely. I like Wooden Spoke, and will continue to come here. It is close by the house, Mike’s a really nice guy, and the food is good and very reasonably priced. The brisket needs a little more work and this is not “wait in line an hour before open” level yet, but it is good solid BBQ. Do you plan to try other BBQ offerings in the area? There has been, from time to time, a bbq trailer just outside of the southwest corner of the retail center at Woodlands Pkwy and FM 978. Have you sampled their bbq? And what about the other area providers of Q?
? Corkscrew BBQ ( Goes through some 600 lbs of smoked meats, 5 days / week ) frequently sells out early.
? 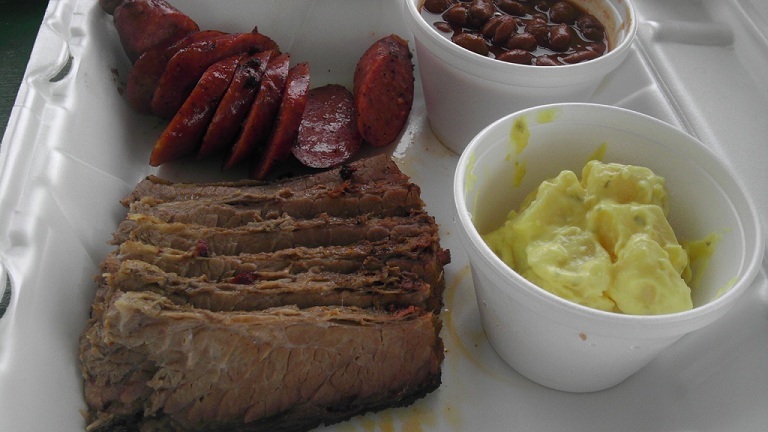 Pitmaster BBQ – *Voted as top in the area by readers of Woodlands online. I haven’t seen the trailer you mention at Woodlands Pkwy and 2978 but I’ll look for it. I’ve been to Country Time and have a review ready, but it was not good. I had high hopes with the real smoker and stack of wood out front. I’ve been to Corkscrew twice, with my most recent visit 7-26-2013. It has been excellent both times. I’ll post up that review ASAP. Corkscrew, Gatlin’s, and Killen’s are my top three in the Houston area. I used to go to Pitmaster for the chopped beef potato before I started blogging. My most recent visit for brisket resulted in grey, flavorless meat unfortunately. I went to the location on the East side of the freeway but used to go to the one on the West side. BBQ Hut in Magnolia has good chopped beef, but their brisket wasn’t that good. Hill Country BBQ in Hempstead was interesting. Brisket was cooked perfectly (their Facebook page seems to indicate 22 hour smoking time) but it was light on flavor. The sausage was good. A little further out, Fargo’s in Bryan was really good. Some other area joints I’ve been to like McKenzie’s also were not noteworthy. 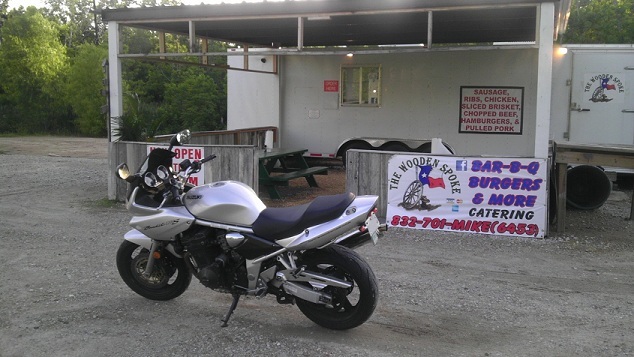 There are a few I want to try up by Lake Conroe; Early BBQ, Texans BBQ, and Uncle Bob’s if they are still open. Thanks for the comment. Certainly let me know of any places to try and if you ever would like to meet up for some local BBQ let me know! Yes, we’d like to meet up with you and sample some local BBQ. I did try them out last week, the buns were good and interesting sausage but brisket still needs work. I didn’t see a wood smoker or stack of wood so they are either cooking most of it offsite and warming it there, or it’s a gas pit. (I saw something stainless in the side of the trailer but couldn’t tell if it was just a warmer or something like a Southern Pride gas based smoker. I hit up Uncle Bob’s on the lake and Vernon’s Kuntry BBQ today. I’ll send you an email and we can synch up on a BBQ feast somewhere – thanks for the tip!